Any of these dishes will save you the stress of preparing a meal, so you can spend quality time with your loved ones instead this year. We hope you consider choosing Commellini Estate to service your holiday meals. Choose one, two, or all of our products to serve for any event you may have coming up! You will pre-order online HERE on our website. Pick up is required for all products, including online purchases. When placing your order please specify where you would like to pickup. Experience Leda’s famous Italian food from the comfort of your home. Dalla nostra cucina alla tua! Established in 1941, Commellini Estate is a third generation venue and event restaurant. We offer a private location surrounded in the majestic trees and tranquil sounds of Spring Creek in the Dartford Valley, creating the perfect setting for weddings, corporate events, birthdays, anniversaries, Christmas parties and other special occasions. 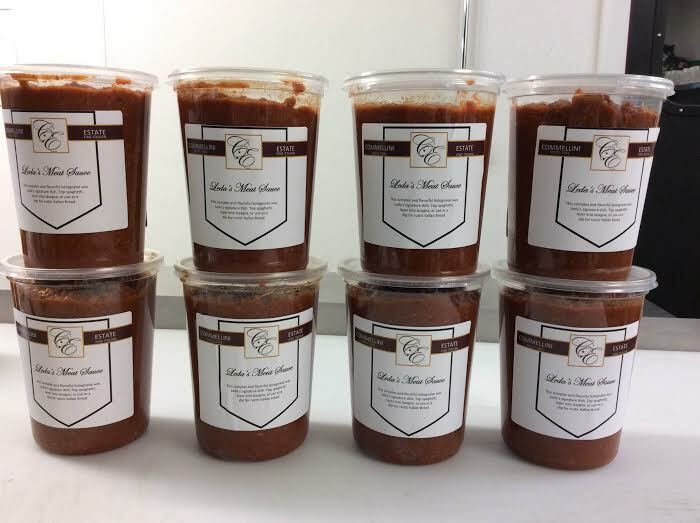 We had many people request to have our menu items more frequently and thus our Frozen Product line was born. Commellini Estate’s line of fine Italian foods carries on the tradition of Leda Commellini in 1941. Leda Began cooking for guests in her home over seventy years ago and we still prepare her recipes the same way today. Commellini Estate is proud to provide the same quality and tradition started by Leda for home use in our frozen products. All products are made from scratch and fresh frozen as not to add any preservatives. 2) What will you be offering at the farmers market? We will be offering our fresh frozen Italian meals and sauces. We have weekly specialty lasagnas with seasonal roatating ingredients. We always come stocked with our three sauces (Leda’s Bolognes Meat sauce, Albert’s White Wine Alfredo, and Gina’s Marinara), the famous Chicken Cacciatore (which made Commellin’s famous with Joe DiMaggio and Marilyn Monroe. This paritcular dish still takes over 20 hours to create from scratch), and our Meatballs in Marinara sauce. 3) Where do you sell your product? 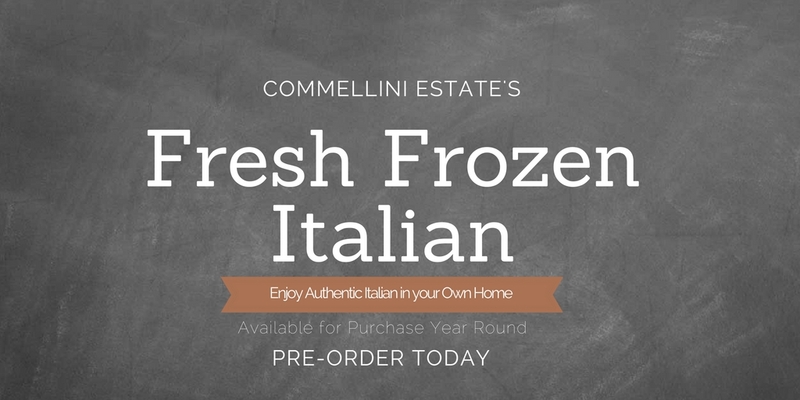 We sell our Gourmet2Go line year round at Commellini Estate. During the warmer months we are also at the following Farmers Markets: Fairwood, Kendall Yards, Spokane Valley, and Liberty Lake. If you would prefer to pickup at Commellini Estate please call 509-466-0667 in advance. Our office hours are 11:30 AM to 6:00 PM Tues-Fri, but we do not sell items during events as not to be disruptive. Commellini Estate is located in North Spokane in the Dartford Valley. Our address is 14715 N. Dartford Dr. Spokane Wa 99208. 4) What makes your offerings unique? Our Frozen Product Line is a tribute to Italian cuisine-modern, refined, and beautiful in its simplicity. We keep with tradition in that Italian cooks rely chiefly on the quality of the ingredients. We prepare all items in the same manner that Leda’s Commellini did back in 1941. We never cut corners and think this reflected in the taste and quality of our product. However we will let the consumer be the judge and will be offering weekly samples at the market for everyone to try. 5) Do you have an Gluten Free items? Yes, the following items are gluten free: Chicken Cacciatore, Leda Meat Sauce, and Gina’s Marinara. 6) Do you have an Diary Free items? Yes both the Chicken Cacciatore and Leda’s Meat sauce are dairy free.